This is part two of a two-part interview with Michael Conley. In the first part, Michael discussed the art of the short story in general and his inspirations. 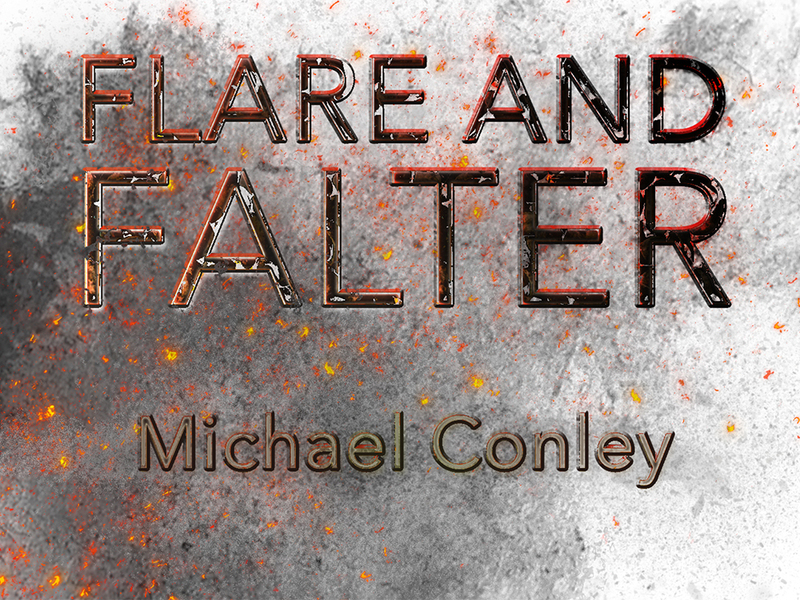 Michael Conley’s collection of stories, Flare and Falter, is published by Splice and available to order now. Yesterday, Daniel Davis Wood spoke to Michael about his writing process and his movement from poetry to prose. Here, the discussion continues with a focus on the origins of Flare and Falter and the nitty-gritty of putting together the collection as a whole. 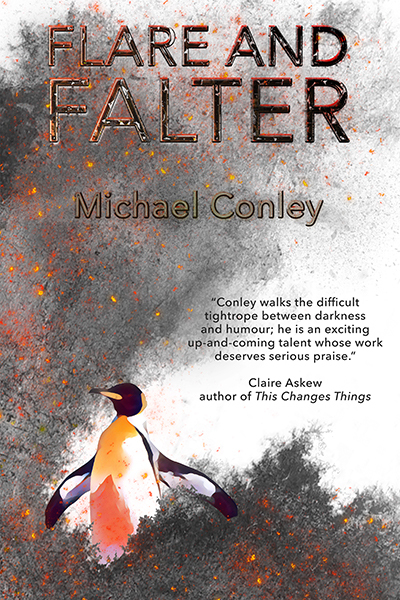 There are thirty-five stories in Flare and Falter, and they arrived at different stages, in different batches, written in different ways. Let’s start with the ones that were there from the very beginning. Towards the end of last year, you were independently working on a collection of short stories and you already had a bundle. Most of these early stories were flash fiction pieces, and more than a few of them have ended up in Flare and Falter. I count only two that clock in at over 1,000 words, and the majority hover between 500 and 750 words. Some haven’t changed much throughout the editing and redrafting process, but some are quite different and probably more expansive. Looking back on these stories in light of the longer work you’ve produced more recently, how do they strike you now? I think that core of stories for me represents a point at which I thought I had some prose worth publishing. As I said earlier, I’ve spent the last few years seeing myself only as a poet, but throughout that time I’d been putting aside ideas that didn’t quite work as poetry and keeping them in their own folder. In a way, that process meant that those stories had already been through a kind of editing in the sense that I’d already thought a lot about the precise language in them and about how they worked or didn’t work structurally. At some point last year, though, I started realising that the folder was getting bigger and bigger, and things I sent off from it were starting to be accepted by magazines and win prizes. It feels like faint praise to say that they exist because they failed as poems, but it’s true, and that doesn’t have to be a value judgement. In fact, when I first put them together into a manuscript, I wanted to play on that idea so I entitled the collection An Inferior Art Form. 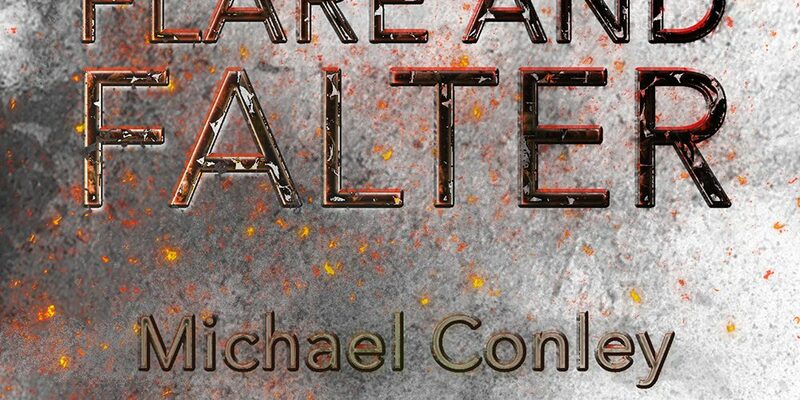 And I thought it would be funny to have a bio that read “Michael Conley has published two collections of poetry and one collection of prose: An Inferior Art Form.” But I don’t actually believe that they’re inferior, and maybe the title isn’t that funny. Anyway, I think that at its best, flash fiction, or prose poetry, or whatever you want to call it, does bridge a gap between poetry and prose. Lydia Davis’ work is a good example: her very short pieces are as disorientating and elusive as good poetry. Or, more recently, the pieces in Lucy Corin’s 100 Apocalypses and Other Apocalypses. They have the sort of snapshot, non-narrative quality associated with poetry, but without the visual and rhythmic formal constraints. Poetry clothed as prose, maybe? Or poetry that’s let itself go? I’m not sure if that makes any sense at all. At any rate, those early stories you mention are probably my attempt to try to inhabit that ground. Are there any stories in the original batch that didn’t make the cut, though you wish now that they had? Yes, there are more. But no, I don’t wish they’d gone in. If they’re not there, then it’s because they didn’t work or didn’t fit, and it’s important to be brutally honest. I have a folder on my desktop entitled ‘Not Good Enough’, which contains a larger proportion of writing than all my other folders — and it feels right that that’s the case. So, then, the next batch of stories you wrote were the ones like ‘Amok’ and ‘To Armour a Vehicle’: a little longer than the others, more plot-driven, more eventful, and not included in An Inferior Art Form. It feels to me as if there was a leap, or a level-up, rather than a gradual progression, between what you were doing earlier on and what you were trying to do after you completed the first iteration of the collection. Would you agree with that? Yes, I recognise this. I think it goes back to what I was saying about feeling a bit of freedom from the constraints of poetry. I sometimes feel when I write poetry that I’m trying to keep plot and narrative at bay. And because I was writing these, as you say, in a kind of period where there was no pressure on them, I suppose they did feel like me trying out something new. Definitely ‘To Armour a Vehicle’ feels a bit transitional, now that I look back at it — but hopefully still interesting as a piece. Why does that story in particular seem transitional to you? Do you mean that you see it as having limitations which you’ve now exceeded? Not exceeded as such, because I don’t really see it exclusively as a process of improvement, more a process where I explored different methods of expressing things. And ‘To Armour a Vehicle’, in particular, is a longer piece than a poem but it still doesn’t have as much narrative as the later ones, which are more expansive. I suppose it has things in common with a dramatic monologue, and maybe that’s why I see it as something that bridges the gap between the poetry I was used to and the plot-driven stories I wrote later. I guess another transitional period began with the writing of the ‘Body Double’ stories. For the uninitiated — which is mostly everyone, since the book isn’t out yet — these four stories all revolve around the same protagonist, a hapless fellow in a faltering dictatorship who works as the body double for a tinpot tyrant. Each story finds the protagonist in a different scenario, although each scenario blurs the lines between honour and degradation. This guy is aware that he enjoys a rare privilege, being so close to the seat of power, and yet, in practice, his ‘privilege’ involves debasing himself in various ways, for the amusement of his boss, with no way to refuse, or even to quibble, and in fact with a real eagerness to please. These stories came about through an interesting process. You wrote one story which I suggested splitting in two, and then I gave you some tips on how to develop other stories using some of the latent potential in the premise. A lot of writers don’t go through something like this. I’m glad you were game for it, though, because I feel like there are now some brilliant, quintessentially Michael Conley moments (the comfy-looking chairs in ‘Security Detail’, the tragicomic dilemma in ‘Personal Chef’) which wouldn’t have existed without that prodding. What was this experience like, from your side of the fence? Exciting! I think as soon as we started talking about publishing with Splice, with your offer of very detailed and hands-on editing, I saw it as a huge opportunity to learn. The ‘Body Double’ stories were, like ‘Quetzalcoatl’, originally a series of poems, some of which I was happy with, some of which I wasn’t. But unlike ‘Quetzalcoatl’, they didn’t really work when I tried to bring them together, and they felt too fragmented. So your suggestion to just embrace that fragmentation and have them become a series of more free-standing, loosely-linked moments really worked, and unlocked lots more ideas. So much so that I’m probably not finished with that character and situation. That’s good to hear! I feel like there’s more to be seen from that character, too. Speaking as a reader, I certainly hope so. When I think back on that “hands-on” editing process, I realise that I was always anxious not to have those stories carrying my fingerprints. I wanted to help you bring things out of what was already there, rather than feeding things in. And indeed, when I read the ‘Body Double’ stories now, they don’t strike me as the sorts of stories I’d be inclined to write — or even the sorts of stories I could write — and I love them for that. That’s ultimately what I mean about prodding: I felt like a guy at a jukebox machine, and I had an inkling that if I could just press a few of the brightest buttons, without really knowing what the results would be, maybe I’d cue up some killer tracks I’d never heard before. And it worked! But I definitely went into it first and foremost as a Michael Conley fan, not as an editor, just wondering how I could help the world receive a few more Michael Conley stories. Does that ring true to you? Or are there moments in those stories where something doesn’t quite chime with you as a writer, where maybe I was treading on your toes? I like the jukebox analogy, and I understand it, because I think basically you’ve just described what good teaching is. And what the best moments in the seminars I did at MMU were like. It’s not an easy thing to do, and not everybody is good at it, because it requires a lot of empathy to reach that deep level of understanding about what another writer is trying to achieve on their terms. And it also requires an ability to put aside ego. I think you did a great job of nudging me towards where these stories ended up. There really weren’t any moments at all where I felt you were taking over or pushing things in a direction I wasn’t happy with. So, thank you! Even if this book sells zero copies, I’ll feel I’ve come out of the whole editing process having learned a lot of valuable stuff about how writing works… although obviously I hope it sells tons of copies, too. So the next batch of stories was the one where I began to get a bit jealous. These stories just started rolling out of you, one after another, needing comparatively minimal input from me, and it was clear that you were surfing one of those sustained waves of creativity that writers yearn for. Not only that, but you also seemed to be stretching your talents in all sorts of ways — these stories are the longer ones in Flare and Falter, more complex in their use of perspective and tense, and more varied in their tone and sentiments. There’s a sweetness to some of them, as well as darkness, and in ‘Kraken’ you’ve even got an apocalyptic story that actually works as a beautiful, satisfying romance, if you broaden your perspective as a reader to value more than the dramas of the (typically incompetent) human characters. Can you talk a little about this period of writing? Satisfactions and frustrations? Unexpected successes and failed experiments? Yes, those stories did seem to come quite quickly, and I did have a period of a few months where I felt like everything I saw and heard was a potential story idea, and then most of the ideas did turn into stories. There were really only a couple of ideas I had that didn’t develop: looking at my ‘Not Good Enough’ folder, there’s one where I tried to write something about the two characters in Auden’s poem ‘O what is that sound’, and I abandoned it because I realised they were too similar to the two characters in the bunker in ‘Personal Chef’. But other than that, yes, it was an unusual period where the hit rate was quite high. I was watching these stories roll in and basically trying to take a step back, so as not to disrupt the flow or destabilise your creative energy. From my perspective, you knew how to wield your tools and the process became simpler. But I realise that this means I was, and am, blind to what you were doing behind the scenes. What was I missing? I think having a full-time job plays a big part. I know not everybody is like this, but I’ve found I’ve always done my best writing at times when I’m busiest at work. (Although not literally at work, I should say.) I hardly write anything during half-term holidays. I’ve thought about why this is, and I think there are two reasons. Firstly, because during term-time, it’s a fast-moving and stressful job, so even when I’m at home in the evening, I’m in the ‘get stuff done’ mindset, and I think I’m lucky that I’m able to channel this into writing. Secondly, because I teach A-level English, which means I get to spend most of my working life having discussions with intelligent students about literature — so even when I’m not writing, the work I do feeds into my writing on some level. How did that play out in terms of the labour of sitting down to write, and the trial-and-error process of it? Nothing really beyond the usual process of writing the first draft quite quickly, then re-reading and editing more slowly, then sending it off. But I think it’s important not to romanticise that process, too. It does feel like riding a wave and it’s easy to see it as some sort of alchemy, but my feeling is that the truth is more mundane: it’s the direct result of lots of hard work and lots of hours spent reading and writing. I wrote ‘Kraken’, for example, very quickly in two short bursts, but I certainly couldn’t have done that if I hadn’t been writing steadily most days for the previous six months. I want to come back to your role as a teacher in a moment, but for now I’d like to ask you about the final batch of stories you produced, which, in this case, is actually only one story: ‘All the Little Yous Just Find Each Other’. When you wrote this story and sent it to me, you said that it might be your favourite story of the whole lot. I’m definitely really proud of that one. I’ll tell you this now: it is my favourite, absolutely. How was the experience of writing this story different from writing the others? And what do you like about it? As I mentioned earlier, the first spark for it came from the final line in a James Wright poem. The poem is called ‘A Blessing’. The tone of Wright’s poetry is so fascinatingly ambivalent, so he gives you this beautiful, romantic image, but it’s also confusing and out of the blue and bittersweet. I wanted to replicate that feeling over a longer story, using the same image as a central conceit. I think perhaps the other, more unconscious influence, was Ursula K. Le Guin’s short story ‘The Ones Who Walk Away From Omelas’, the first half of which is a description of a utopia. I fancied having a go at that, since a lot of the stories and poems I write are quite dark and often pessimistic. But then, like in the Le Guin story, there’s a kind of twist on that, too, in the second half, based on the idea of the price we pay for happiness. I also just really enjoyed writing it: building the world, thinking of the odd little details that such a big change would throw up for people on a personal level. I had a lot of fun with the bit in the middle, another sort of twist, where we find out who the narrator of the story is. That allowed me to bring in uncertainty about everything that had come before and present a different side to the character of Grace, too. Each of those elements works beautifully. For me, though, the real beauty of the story lies in the way all of them work together when really, in theory, they shouldn’t. They should clash almightily. There’s no sane world in which a story that starts off as an absurdist media satire can suddenly morph into something breathtakingly innocent, then morph again into an expository account of a utopia, then jump into a completely new mode of narration, and then conclude with a sustained passage of hypothetical, conditional action that is just so unremittingly dark but feels calmer and — like Wright’s poem — bittersweet. These things are so disparate that they shouldn’t be able to gel, and yet, well, the story speaks for itself. You make it sound like the fun of writing it was almost a “Jackson Pollock splashing around with a bunch of different colours” type of experience. But did it ever feel like a high-wire act, like something that could end in chaos if just one element went awry? How much care and attention did you have to pay to balancing all these discordant things? Hmmm. The honest answer is: not much. I hadn’t really looked at it that way, in terms of genre, when I was writing it, but I suppose when you step back and look at the story it is a strange mix of genres. Maybe a good analogy here is the coyote running until he realises he’s out of cliff, at which point he looks down and starts to fall. Maybe I was just running but I wasn’t aware I was running out of cliff, and somehow I managed to reach the other side because I didn’t look down? One thing I’m interested in is taking a concept and then just continuing to pursue it until it’s exhausted. So, here, the concept was “now people can choose to burst into blossom”. I wanted to write the story until that concept became normal, and then see what happens. So it’s just as interesting to me that, say, people stopped throwing confetti at weddings in this world, or some people chose to continue being blossom as long as possible because it was better than being human. I know I keep mentioning other writers, but a good example of this is, again, Lucy Corin’s 100 Apocalypses and Other Apocalypses, which is a collection of very short stories in which it’s already a given that the world is post-apocalyptic, so much so that it’s only ever mentioned in passing. So that’s what I was trying to do, and that’s probably why it ended up so chaotic. I love that image of the coyote, and the story carries the feeling of his hopeful flight. It doesn’t seem like a work of random, directionless chaos, but of a very single-minded bolt towards a fantastic object in the distance. And I really have the sense that if you’d written a story like this in a workshop, for instance, every step of the way you would’ve been discouraged from doing all the different things the story does so seamlessly. You would’ve been told to look down into the gorge, and then you would’ve lost the momentum that propelled you. Which brings me to my last couple of questions. You’re a teacher yourself. I imagine your classroom as a kind of a lively, animated, egalitarian forum with you sometimes in the middle, sometimes on the sidelines, in the role of Socrates. But what’s it really like? Can you give me a glimpse inside? You’re talking about the chain-smoking Brazilian footballer, right? Lively, Socratic, animated, and egalitarian are all things I’d definitely aspire to, but you’d have to ask my students about how well that’s achieved day-to-day! But yes, I think they’d say that we do a lot of discussion and open questioning, and hopefully they’d also say that studying English is all about exploring ideas rather than getting definitively right or wrong answers. I’ve been a teacher for ten years and the best thing about it is still being in the classroom talking to people about books. Something I’ve noticed: in the author biographies in your previous publications, you’ve gone out of your way to put your teaching duties front and centre. How does teaching intersect with your creative practice and maybe influence the work you produce? I’m not sure my experiences of teaching directly affect the work I’ve produced, in the sense that I’ve never written a poem or story about being in the classroom. But I think it does have an impact. One way, perhaps, is that there are several classic texts that I feel I know inside-out because I’ve taught them for years — Atwood’s The Handmaid’s Tale, or Hardy’s Tess of the D’Urbervilles — and what I’m teaching with those texts is the deconstruction of methods: narrative perspective, plot arcs, characterisation, et cetera. There’s no way that this hasn’t helped me when I came to constructing my own stories.